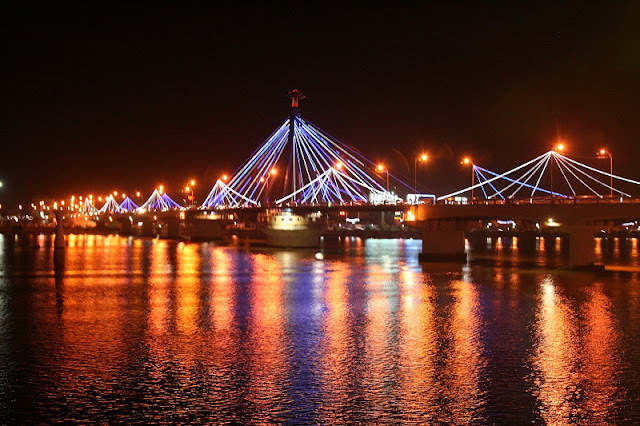 Danang is named as "light city" with residential areas and bridges spanning the Han River that illuminate tourists for night. Designed with fire dragon image, it is the symbol and pride of Danang people. Dragon a symbol of Asian prosperity, the dragon is an ideal image for a city on the rise and has been taken to heart by the people who live here. Dragon-themed trinkets can be bought along the banks of the Han River, which the bridge spans and nearby hotels take their name from the structure.\r\nEach weekend, after sunset, residents and visitors are treated to a pyrotechnic show that adds flair to what could have easily been a routine civil engineering project. 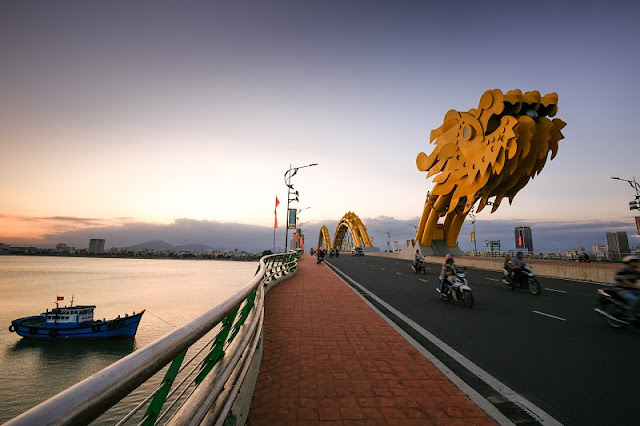 Opened 2013 in Vietnam’s central coast city of Da Nang, the Rong Cao (Dragon Bridge) is an award-winning, U.S.-designed marvel of engineering that’s become a favorite of residents and visitors, and an icon of the prosperous future this once sleepy town has its eye set on. The largest and unique rotating bridge in Vietnam. The bridge rotates 90 degrees from 0h30 to 1am every day. Han River Bridge is the first bridge that Vietnamese architects and workers designed. It was built by the people of Danang and holds a special place in their pride for their city. 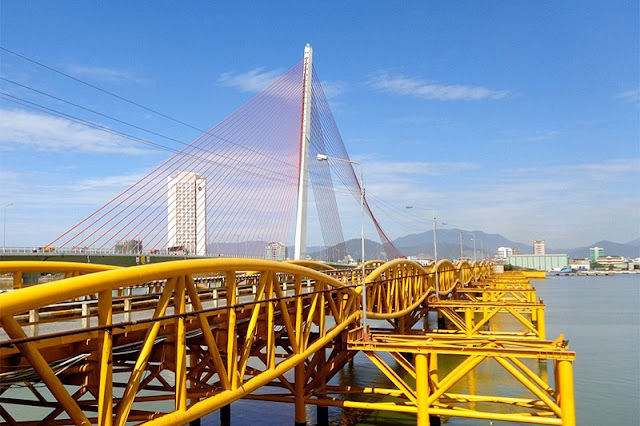 The bridge is the unique swing bridge to be built in Vietnam and it is also an important part of Danang’s cityscape. The Han River Bridge is the symbol of new vitality and the developing desire of the city was built with the contribution of the entire city’s people. It does not also facilitate transport and potential for tourism but also a cultural spot of Danang people today left behind for the future generations. Not far from the Dragon Bridge is Tran Thi Ly Bridge, designed to appear as a sail. The bridge was built in the French colonial period, 1950. The bridge is shaped like a sail. 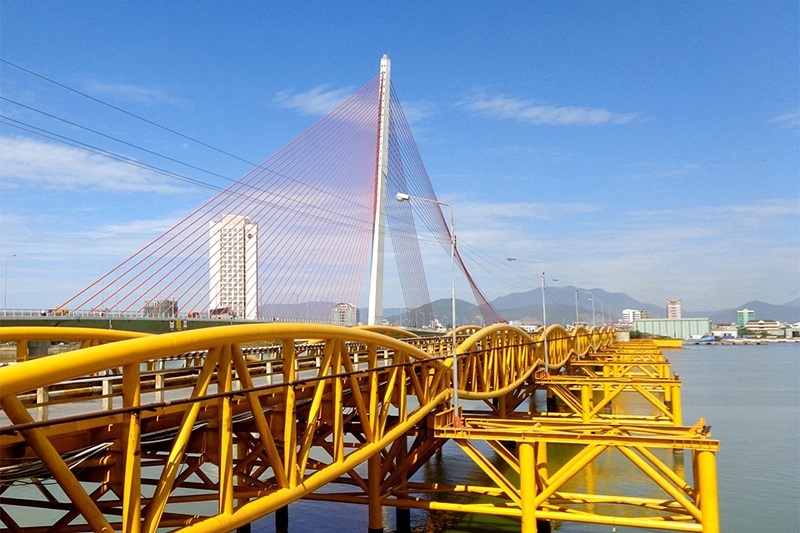 This concrete cable-stayed bridge is a significant landmark of Danang. The colors of the bridge’s elegant pylon and deck change at night, creating an iconic, eye-catching landmark in the city every evening. The bridge is also an ideal place for tourists and residents to take photos when the sun sets. The bridge was designed by the US and completed in 1965. The unusual design of the bridge, particularly the single inclining tower, presented a number of technical challenges. The effective width of the deck is 34.5m, and the cables in the main span are located along the middle line of the bridge. The western abutment is also designed as a ballast load for the heavy 230m-long main span. The bridge will have six lanes for traffic, plus pedestrian sidewalks on both sides. The most recent and Golden Bridge at Sun World, Ba Na Hills. Golden Bridge at Sun World, Ba Na Hills is 150 meters long, 1,400 meters above sea level, was opened in June, 2018. Just two months after its launch, the Golden Bridge has attracted a huge number of tourists and media attention all over the world. 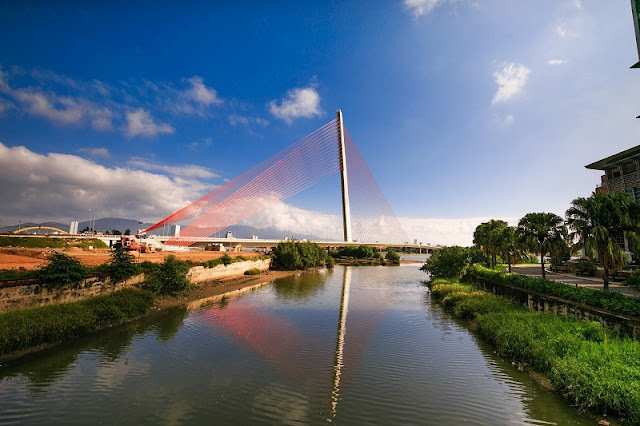 Numerous newspapers and television channels have reported on the pedestrian bridge in Da Nang city with admiration. Economic Times praised the design of the Golden Bridge to help visitors feel like walking on the thin strip of silk between the sky. Reuters said the Golden Bridge's architecture was like the Lord's hand pulling a golden thread off the mountain. 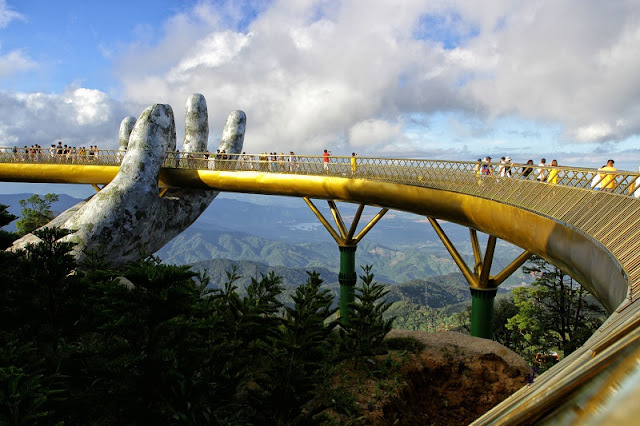 The Golden Bridge is the most attractive tourist attraction in Da Nang city, and emphasizes the unique design of hand that has existed for centuries. The Guardian of Britain commented, the Golden Bridge has reached a scenic point, not just a simple construction.